Announcing BizTalk Server 2016 Community Technology Preview 1! Recently I got a chance to install and configure the ESB Tool Kit and ESB Management portal in multi-server environment. Below are the steps which I followed to successfully configure and deploy the ESB Management portal. Copy the ESB portal source code from the development server in C:Projects folder and Remove the read-only attribute of this folder. Go to the C:ProjectsMicrosoft.Practices.ESBESBSourceSourceSamplesManagement PortalInstallScripts location and edit Management_Install.ps1 script. Comment the [BuildManagementSolution] function of Power Shell script. (This is required because there is no need to build the solution again). Open a command prompt using “Run as administrator”. Execute the Management_Install.cmd command located in “C:ProjectsMicrosoft.Practices.ESBSourceSamplesManagementPortalInstallScripts”. Open the IIS manager, Select the ESB portal and check the authorization. If all fine, Browse the ESB portal directly from here. If some error occurred, Change the authorization and app pool setting by checking user access. Repeat the same step to other server. Please let me know If any suggestion on this or Feel free to add some point. 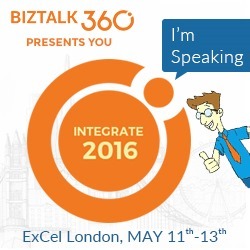 BizTalk360 has recently released more details on their annual conference in London. This year there is a name change. Instead of the BizTalk Summit, the name gets altered to align with the “Integrate” brand. In case you were not aware, BizTalk360 organized the last Integrate Summit in Redmond back in December 2014 so it makes sense to carry that name forward. BizTalk360 has been working closely with the Microsoft product groups to put on a great event. This year the summit looks to be better and bigger than ever. There are more than 20 speakers lined up over 3 days . The speakers have a variety of backgrounds including Microsoft Product Group, Consultants, Customers, System Integrators and MVPs. There is also an opportunity to hear from the Microsoft’s leadership team and get insight into their plans as it pertains to Azure App Service and Integration. My topic will focus on some the recent learnings from an Industrial IoT project. I will talk about tag data ingestion, complex event processing (calculations, reference data, out of bounds, absence of event) and visualization. I will also throw in a little BizTalk and Logic apps for good measure. This will be my third time speaking in London at a BizTalk360 event. I am once again looking forward to the experience as BizTalk360 always puts on a good show and it is a great opportunity to network with the excellent European Integration community. For more details, please check out the event page. There are early bird specials so pay close attention to the dates. BizTalk360 is becoming increasingly popular as a monitoring and management tool for organizations that use BizTalk. And there’s good news for BizTalk360 users everywhere: You can now extend the BizTalk Deployement Framework (BTDF) to automatically deploy your BizTalk360 alerts!